That was the interesting topic of Nadjas course this semester. This Friday her students are going to present their topics on beautiful posters from 2 – 4 pm (ZKF1, E.144). Feel free to join the discussion. Guests are welcome! The poster on Alzheimer’s won the poster prize. Congrats Alex, Milena and Sophie! Recently, Nadja was selected as a member of the Global Young Faculty 5. 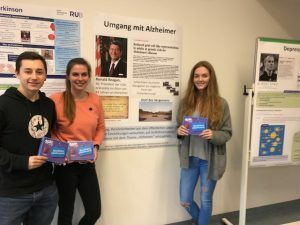 This initiative aims to connect young researchers from universities and non-university research institutions located in Essen, Bochum and Dortmund.